Jackson Glacier can be viewed from the "Road to the Sun", or "Going-to-the-Sun Road", or simply "The Sun Road" depending on who you talk to. This road was started in 1921 and finished in 1932. It is the only road that crosses Glacier National Park. Jackson Glacier was once part of the largest grouping of glaciers in the park, including the Blackfoot and Harrison Glaciers. The glacier was most recently measured in 2005 at 250 acres. Between 1966 and 2005, Jackson Glacier lost almost a third of its acreage. Some quotes are worth repeating. "Every morning I awake torn between a desire to save the world and an inclination to savor it. This makes it hard to plan the day. But if we forget to savor the world, what reason do we possibly have for saving it? In a way, the savoring must come first". Beargrass is one of the first plants to appear after a forest fire. This area last burned in 2015. It's been 2.5 days since my last post. In the meantime, I rode the iconic "Road to the Sun" from St Mary's, MT to West Glacier and then on through Whitefish, to a small pleasant town in western Montana near the Canadian border called Eureka. Today I am taking a day of rest. The view behind my motel in Eureka, MT. My route took me about 120 miles over two days with a lot of elevation gain. You can see both days in 3 installments here, here and here. The day on Sun Road is broken into two segments because I lost my GPS connection on the pass, and then again afterwards. If you study the trajectories you'll see my GPS has me biking across MacDonald Lake on the west side of the Park. If only I could do that! At Logan Pass on the Continental Divide, elevation 6646 ft. I've already mentioned the wonderful visitors center on the west side of the Park. When I was there last Sunday I was given a brochure written by the National Park Service about Climate Change at Glacier National Park. It tells us that over the past 100 years the Earth's average temperature rose by 1.5 degrees Fahrenheit. It goes on to explain that if we continue to emit greenhouse gases at current rates, temperatures could rise from anywhere 2 to 7 degrees Fahrenheit by the end of this century. In general, we will see more deadly heat, intense hurricanes, rising sea levels, extreme precipitation and drought, and vanishing glaciers and sea ice. 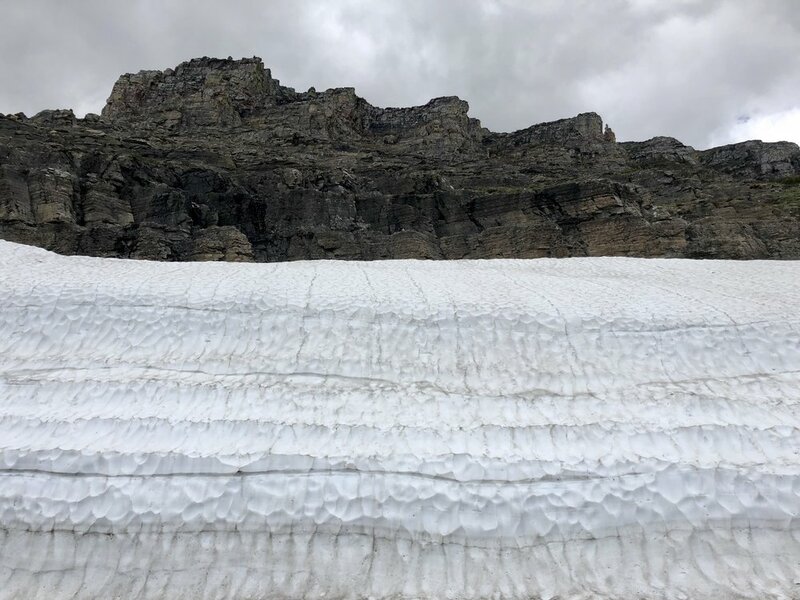 At Glacier National Park, there will also be changes in the water cycle and major changes to the many plants, animals and people who are adapted to the present climate. Coming down from Logan Pass on The Sun Road. In addition, the same brochure explains that mountain ecosystems in the northern Rockies are experiencing temperature increases 1.8 times faster than the general global warming pattern. And at elevations above 6000 feet, temperatures are rising at 3 times the global average. This is what has driven the extraordinary loss of glaciers from 150 in 1850 to the 25 that remain today, with the largest losing roughly 75% of their size during that period. And, although I've already written about this, scientists predict the glaciers will be entirely gone by 2030. It's hard to distinguish a glacier from a snowpack at first glance, but glaciers are made of ice. This is snow butting up against a rock face. Most likely, this will be gone in a few weeks. Glaciers in this park, on the other hand, are at least 7000 years old. One might wonder why a layperson like me would spend so much time dwelling on such disturbing news? I do have a reason. I think our current social narrative about climate change falls way short of the climate conditions occurring all around us. The situation is no less than an emergency that demands an emergency response, yet we live as if civilization isn’t facing the threat of ecological catastrophe in the coming decades. But it is. In this instance, our capacity for cognitive dissonance may literally kill us. I recently heard a psychologist explain how our social response to climate change (or lack thereof) is a form of "Pluralistic Ignorance." I had not heard this clinical term before, but I saw it's usefulness immediately. Pluralistic Ingnorance refers to how we take cues from those around us to determine the severity of a situation. For example, if someone sitting on a bench in a subway platform in New York City is slumped over with his eyes closed and people are walking by without reacting, most other people will assume that person is simply asleep. Yet, it's possible that person has had a medical emergency or may even have died. But most of us take our cues from others, so if others are not alarmed, we probably will not be either. The land to the west of Glacier National Park. So it goes with climate change. The situation is not good, and we need our social narrative to better reflect our true situation. In the meantime, what can we do? Well, for one thing, we need to talk about our worries, even when others don't wish to listen (or shut down quickly when they do) because the news is so alarming. We need to flip the narrative, so that deniers are the crazy ones, not those of us who are alarmed. To my mind, being alarmed is the sanest possible response. Of course we should be alarmed. After all, based on the estimates of the most conservative scientists, if we continue our current rates of emissions we will push beyond the outer threshold of the 2 degree Centigrade limit agreed to at the Paris Accord in less than 20 years. Clearly, we have little time to waste if we are serious about reducing emissions. There are solutions, however. I recently heard climate scientist James Hansen refer to a recently published study that demonstrates we can slow down temperature rise in a significant way if we will start reducing carbon emissions by 3% a year beginning 2022. This is why we need groups like the Citizens Climate Lobby. This citizen led lobby works in every Congressional District in the US and up to 90% of all Congressional members have been visited by groups of climate lobby constituents. The ask is a carbon fee and dividend legislative proposal that would place a fee on carbon based fossil fuel at the point of sale and then redistribute that fee as a dividend to help taxpayers offset increased energy costs (driving renewable energy to become more plentiful than carbon based alternative). This market based plan appeals to both parties, and can be a true bipartisan solution to climate change (the only kind of legislation that will last in the current political climate). Check it out here.